On the heels of the company’s recent gifts to endow student-run clinics and international service trips, the team from Richmond headed to Chapel Hill to visit the University of North Carolina’s School of Dentistry and see its fabled "SHAC" clinic. Short for Student Health Action Coalition, SHAC clinics abound at UNC, first starting with the Schools of Medicine and Dentistry 50 years ago. The clinic gives School of Dentistry DDS and hygiene degree candidates the opportunity for hands-on learning and providing much-needed oral care to traditionally underserved populations from Chapel Hill, Carrboro, Orange County, and the surrounding region. SHAC is one of 50 clinics in 37 North Carolina counties where dental students volunteer their services, ranging from examinations to cleanings, fillings, and extractions. According to Dean Scott De Rossi, students and faculty oral health services to the community amounted to more than $3.6 million of in-kind dental care to the people of the state of North Carolina in 2017. The SHAC clinic alone delivered more than $150,000 in free dental services to North Carolinians last year. Dean De Rossi explained that the SHAC clinic at the school of dentistry is entirely student-run, with supervision from faculty and adjunct faculty, the latter largely composed of Triangle-area School of Dentistry alumni. A trio of the SHAC clinic’s student coordinators, Marc Gonzalez, Caitlin Burgess, and Damian Slaczka, along with Dr. Allen Samuelson from the School of Dentistry, met with the Richmond delegation, including George Hargrove, Deanna Lessard, and Fran Eskew from the sales and marketing team, to explain how the SHAC clinic operates. Each year, third- and fourth-year students from each of the dental school’s four classes apply for 15 coveted student coordinator slots. These coordinators serve as the clinic administrators, ensuring proper patient service and flow. The SHAC clinic is basically a pop-up clinic, held in the School of Dentistry’s normal operating clinic. SHAC operates on Wednesday evenings, from 6-9 pm, attracting patients largely from word-of-mouth and social media efforts. The clinic hours are held 10 times in the fall semester, 10 times in the spring, and another five occasions during the school’s summer session, for a total of 25 clinic offerings. While a total of 30 student and faculty volunteers comprise the SHAC dental clinic’s team each Wednesday night, different classes and groups have different responsibilities. First-year students handle patient intake and clinical flow; second-years typically run x-rays, while third-years actually perform extractions. Seasoned faculty, both full-time and adjunct, perform more complex and emergency procedures. Each Wednesday SHAC typically attracts between 35 and 60 potential patients. With the resources available, the students are able to select up to 15 each evening, by lottery, prioritized according to triage for acuteness and severity of need. All treatments provided at SHAC are free of charge, and the students also create electronic dental records (EDR) for each patient. In the next couple of years, the patient EDR should merge with the those of the universities standard operating clinics in dentistry and medicine. Ultimately, the SHAC clinic offers select students the opportunity to practice dentistry with different demographics and income strata represented in the SHAC patient population. Perhaps most importantly, according to our student hosts, the SHAC clinic sets a tone for the careers of these future dentists and hygienists, ingraining in them a dedication to public service and the role of dental professionals in improving public health among traditionally underserved communities. 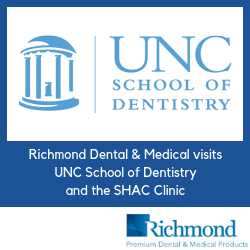 Richmond Dental and Medical is proud to support the students and faculty of the SHAC clinic at the UNC School of Dentistry, through donations from the Barnhardt Foundation and in-kind gifts of dental supplies. We are thrilled to sustain the SHAC clinic for the benefit of both future generations of dental professionals practicing in North Carolina and beyond, as well as the people of North Carolina who benefit from the compassionate, skilled treatment provided by UNC students and faculty.